Midweek entertaining inspired by the cook book of the week. It was apt that I started my cook book challenge with Women’s Weekly Dinner Party Cook Book No. 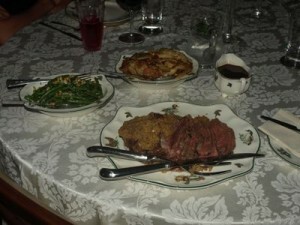 3 as we had dinner guests last night. As it was a mid-week affair, I forwent the full degustation catastrophe and settled for appetisers, sorbet, main meal and dessert. The main meal was the featured cook book offering. this is something I’ve been meaning to try to use up some crappy black olives I bought by mistake. It worked so well that now I’m ding to try it with good olives. Heat a little oil in a fry pan. Brown met on all sides. Cool. Combine all pepper crust ingredients. Press over beef. Preheat oven to 180 degrees. Bake for 1 hour or until cooked as desired. Drain juices into small saucepan with all other gravy ingredients. Heat, stirring until thickened. I made this the day before and reheated it for 20 minutes. Grease a large baking dish. Heat oil in a frypan, add leeks and garlic and cook until leeks are soft. Remove from heat and stir in basil and tomatoes. Spread half the potato slices in the baking dish, top with leek mixture, cover with remaining potato. Mix milk and cream together and pour over potatoes. Bake in a moderate oven for an hour or until potatoes are tender. Place everything except pine nuts in a saucepan and place lid on. Bring to a simmer for 5 minutes. 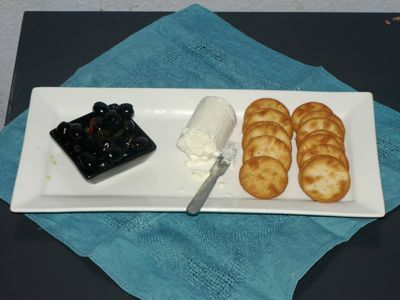 Place in serving dish and top with pine nuts. Make a well in the middle, add egg and milk and mix to a dough. 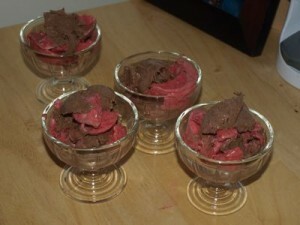 This is a combination of a chocolate ice cream recipe from Stone soup and a raspberry ice cream recipe found on a magazine clipping. Not enough of the clipping remains to know where it was originally from. 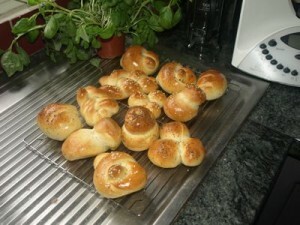 I adapted both recipes to thermomix use. Put eggs, egg yolks and sugar in a heat proof bowl. Place over a saucepan of simmering water and whisk for 4 minutes, or until frothy. Remove bowl from heat. Beat mixture with an electric beater until pale and thick. In thermomix, cook for 4 minutes at 90 degrees on speed 4 then 1 minute at 90 degrees on speed 3. Remove from thermomix bowl and place in large jug. Place berries in food processor or thermomix and process for 10 – 20 seconds (10 seconds on speed 7 in thermomix). Fold raspberry mixture into egg mixture. Beat cream until thick (10 seconds on speed 4 with butterfly in thermomix). Fold cream into raspberry mixture. Have raspberry mixture in one jug and chocolate in another. Select a large container suitable for freezing ice cream. Place in freezer for at least 6 hours until firm. oh yum! honestly you amaze me, there is NO way i could prepare a meal like that on a week day! The trick to this one Karen is that most of it was prepared in advance. The meat was browned and the crust prepared the day before. The ice cream was made in advance. The potatoes made in advance and preheated. I did the beans and gravy just before serving but they only took a minute or so each. Also I only work until lunchtime on Wednesday’s so I the afternoon to organise the house and bake the bread rolls….which could also be done in advance and frozen.